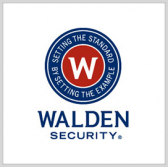 Walden Security has received a potential $122.1M contract to provide protective security services to the Social Security Administration. Work will take place at the SSA headquarters’ main complex, National Computer Center and Security West Building in Maryland, according to a notice posted Friday on FedBizOpps. Walden Security has provided armed and unarmed security services to government customers for more than 28 years. The company is headquartered in Chattanooga, Tenn., and has multiple offices across the U.S.